It’s Time to Celebrate! At Classworks we love to celebrate you and your students. Plus, who doesn't love a fun contest? Congratulations to everyone who participated in this year's All-Star contest! 80%+ mastery during the contest period, January 1 through March 31. Your winning students’ names have been sent to the person indicated as our Classworks contact. 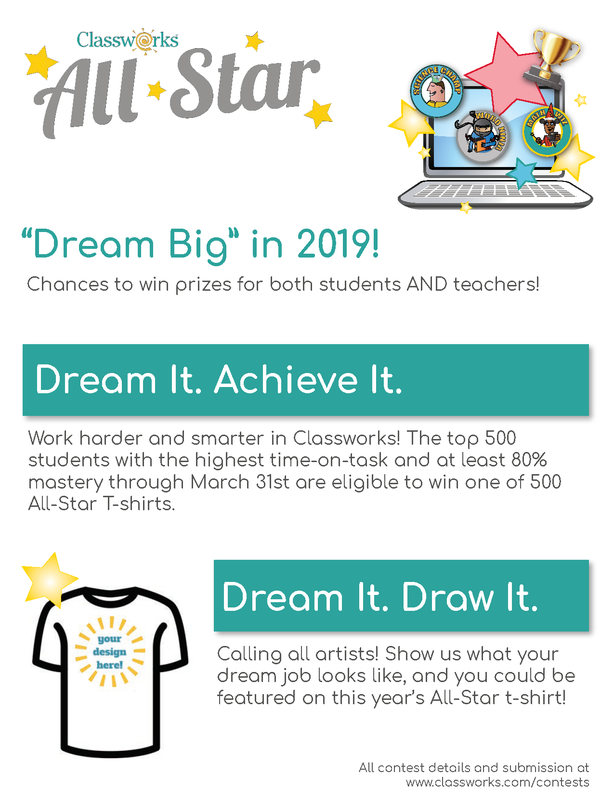 Winning students will recieve a student-designed All-Star t-shirt as a reward for their stellar work in Classworks! Please follow up with your school Classworks administrators to ensure the students are identified for their prizes. 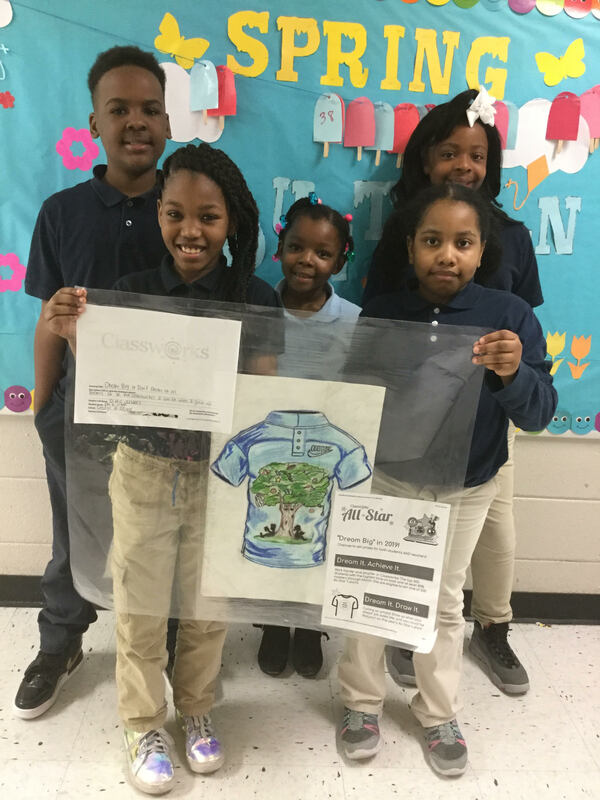 Congratulations to Cashenna Mitchell from Clarksdale Municipal School District, MS for winning the student motivation portion of the contest! Ms. Mitchell crafted her own All-Star mini-contest to keep students motivated. 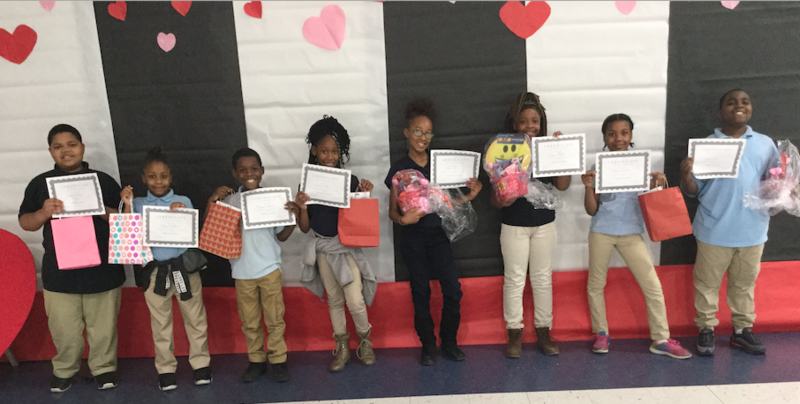 The two students with the highest time and mastery in Classworks in each participating class were rewarded with gift bags. Enjoy your $100 Amazon gift card Ms. Mitchell! Thank you for sharing your clever motivation idea with us! more chances for teachers to win! Teachers have an opportunity to win big again! Post pictures of your student(s) in their All-Star t-shirts on Facebook or Twitter. Classworks will select five teachers using a random drawing to win a $50 Amazon gift card. See the Rules and Guidelines for more details. Thank you to everyone who submitted their "Dream Big" designs. We love seeing the creative side of our Classworks students! This year's winning design was created by students in Amelia McGee's Math Lab at George H. Oliver Elementary. Congratulations to Serenity Taylor, Marianna Collins, Ava Hearon, Keith Young, and Canecia Pollard! Their collaboration was truly inspired. We are so excited to feature this winning design on the 2019 All-Star t-shirts! Questions about the contest? Email info@classworks.com.